The Eaubonne Montmorency Hospital Group needed a unified CMMS system to manage the activities of its various departments. In order to centralise the management of curative and preventive work, benefit from a database of equipment, generate indicators and reports and to improve stock management they chose COSWIN 7i, a fully web based CMMS solution. Simone Veil Hospital was formed when the Eaubonne and Montmorency sites merged. The challenge for this Hospital Group is to choose a maintenance tool that is both ‘multi-site’ capable and highly customisable. 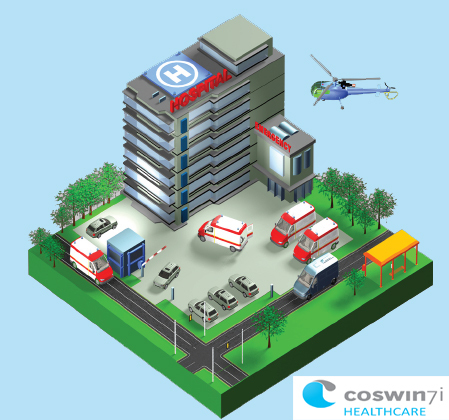 The maintenance management in hospitals covers several different departments each with their own group of users. The Biomedical Department is responsible for the maintenance of medical equipment. Its responsibilities are to «Ensure the Maintenance of equipment» and «Ensure the safety of people and equipment». This department is composed of 5 people. The Technical Department manages all the non-medical equipment of the establishment; buildings, plumbing, heating, air conditioning, paint, lifts, furniture, beds and so on. The department is composed of 22 employees. Finally, the IT Department is responsible for managing all the computer equipment. It is composed of 12 employees. 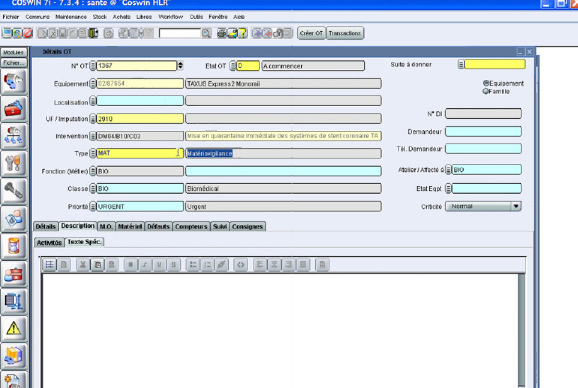 In September 2006, the Biomedical Department was at the beginning of a process for the implementation of a comprehensive CMMS solution for all three departments. of its modules. The hospital maintenance has now undergone a revolution. Up until the implementation of Coswin, each department worked independently. Now they are all able to work together and share information. “In order to simplify and harmonise things, we wanted all the services to be using the same piece of software”, explained Nadége Aubert, the manager of the Biomedical Department. Another peculiarity of the hospital is that the maintenance is planned according to buildings and geographical locations for the Technical Department while the Biomedical Department manage their work according to the equipment involved. The technicians who carry out the work often travel between the two sites. Making things simple for requesters and workers. The three maintenance departments have an unlimited number of users who can create job requests. However, nearly 70% of the job requests are created by the department maintenance staff, rather than by others who submit their requests by email or telephone. that covers all the workstations. A completely customisable, modular deployment. Each profile that is defined in Coswin has access to specific information. it possible to modify the screens according to each user’s profile. Technicians, Engineers, Managers, Requesters etc can all use Coswin with an interface that has been designed specifically for their needs. curative but the department manager, Mr Berthod, aims to introduce a preventative aspect to the work. new software etc and those that relate to a breakdown of existing equipment or software. The department handled 3218 work orders in 2007 and 3091 in 2008. The IT department aims to optimise the functionalities of Coswin and the quality of information and reporting. “The interesting thing behind the data, are the statistics. The creation of reports and dashboards from which we can identify indicators to press the levers and modify our strategy.”, explained Philippe Berthod. The hospital has a total of 956 beds and all the equipment that goes with them. The department handles about 50 requests per day. They have to be able to configure the software so that it is easy to use for everyone who might need to submit a Job Request, and at the same time they have to define and parameter the nomenclature to be used for all the equipment. 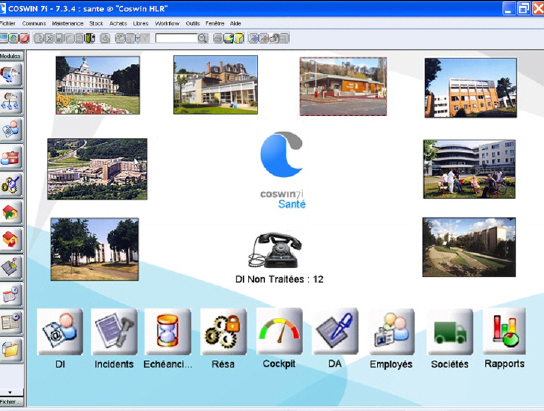 They aim to have Coswin fully operational by September 2009. Medical equipment managed by the Biomedical Department is subject to the “matériovigilance” program. That means that risks linked to a piece of equipment are constantly monitored. The equipment is grouped into 4 classes according to their criticality (see above). If a supplier reports a defective batch or a fault with a piece of equipment via the AFSSAPS (l’Agence Française de Sécurité SAnitaire des Produits de Santé) it is necessary for the staff to be able to manage this and use the information to plan their maintenance tasks. The ability to link documents and files to records and transactions in Coswin makes it possible to track the data and consult the information when needed. Nadège Aubert described the functionality as “The ability to manage documents via the CMMS rather than on paper”. The bio-medical department handled 550 preventative maintenance tasks and 1180 curative maintenance tasks in 2008. They now plan to use Coswin to develop viable indicators and business intelligence, improve their stock management and track costs associated with pieces of equipment.